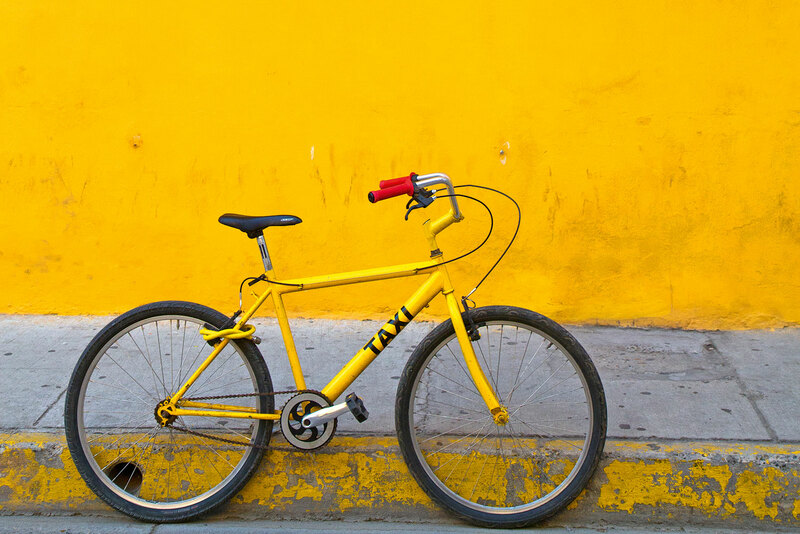 Catching a taxi takes pedal power in Cartagena. Even after sun down, the many shades of this vibrant Colombian city can’t be dulled. Words and photography by Andrew Bain. When the sun sets into the Caribbean Sea, relief blows through the Colombian city of Cartagena. The fierce heat of the day is extinguished and sea breezes drift through the streets and plazas, turning every evening in the city into a celebration of sorts. t’s an appropriate view since, in almost every sense, Cartagena sits balanced between the two absorbing elements of Latin American and the Caribbean, and yet seemingly belonging to neither. Closer to Havana than Lima, it’s a place where baseball is as popular as soccer, and where the music, food and culture are heavily influenced by Africa. The colours of the city are as bright as the Wiggles and the humidity is so thick you can almost drink the air. History dictates so much of the city’s flavour and character. Founded in 1533, Cartagena was South America’s first port and found instant prosperity. Gold and emeralds – Colombia is the world’s largest emerald producer – from the hinterland poured out through its docks, and slaves poured in. More than one million slaves entered the Americas through Cartagena, and today around 60 per cent of Cartagena’s residents claim African descent. So coveted was Cartagena’s early wealth that the city became a regular target for pirates and privateers – it may have been sacked by pirates more often than any other city in the world – prompting the Spanish to build South America’s most impressive defensive walls after an attack by Sir Francis Drake in 1586. Inside these enormous walls, which took more than two centuries to construct, is Cartagena’s World Heritage-listed old town. Its streets are lined with three- and four-storey mansions that reflect the early affluence of the city. The old town is the main tourist drawcard and, though it has few stand-alone feature attractions, it’s arguably one of the finest urban walking districts in South America. One plaza leads to another, each one seemingly pinned to the ground by statues, including the figure of Christopher Columbus, who never landed in Colombia but still lent his name to the country. The streets, which are like narrow gulches between the cliff-like façades of the mansions, make up a maze designed to befuddle the early invaders. To walk here is to put away any agendas and timetables. Every day that I’m in Cartagena, I wander happily lost, rarely heading anywhere except into complete absorption of the city. The old town’s colours are everything you expect of the Caribbean. There are façades as bright as the tropical sun, and others with such a variety of colours they resemble vertical paint charts. The streets are narrow – larger vehicles are sometimes forced to make three-point turns simply to round a corner – and the mansions cast an almost perpetual shade through the streets. But still the daytime heat is intense, enveloping the city in a slumber-inducing haze that doesn’t lift until the sun rolls away. When it does, Cartagena stirs, and stepping out into a passeggiata is as enjoyable and relaxed as any that you’ll find around the shores of the Mediterranean. Evening activity typically begins at Café del Mar, which commands prime position atop the town walls. In the hour before sunset, half the city seems to migrate to the café’s grandstand position, sipping beer and enjoying the city’s finest evening view. Look south and Cartagena’s new city forms a bar graph rising from strips of land as thin as wishbones. To the east are the city’s twin landmarks: Convento de la Popa, a 17th-century convent sat atop the highest hill; and the imposing Castillo de San Felipe de Barajas, said to be the largest fortress ever built by the Spanish in any of their colonies. But most people only look west across the water, watching the sun plunge into the Caribbean Sea, scorching the sky behind it. In the old town, which closes to motor vehicles in the evening, the colours begin to fade but everything else gets more voluble. Horse-drawn carriages clop around the streets, and boutique stores and emerald dealers cast a glow of retail health into the darkened streets. Café tables spill across cobblestones in Plaza Santo Domingo and Plaza de los Coches, which is watched over by the yellow clock tower that has become the symbol of the city. Beer and tropical juices flow long into the evening – the rarest of sights at a Cartagena table is wine. The atmosphere is relaxed and convivial, though it can also begin to feel a little like a European city centre, lacking the raw edge of other parts of South America. To find something a little grittier, I wander out from Plaza de los Coches, beneath the clock tower and leave the old town. I’m heading for the adjoining neighbourhood of Getsemani. Only a few years ago, Getsemani was a seedy and dangerous district, spurned even by Cartagenans. Today, the menace is gone and Getsemani provides a perfect counterpoint to the spit and polish of the old town. It’s a similar architectural experience without the shine; the same grand colonial edifices but here they’re scuffed and graffitied. Getsemani’s streets converge on Plaza de la Trinidad, about 10 minutes’ walk from the old town. Along the walk I fall into conversation with a homeless man, Gonzales, who leads me to the ledge in a wall where his name is spray-painted above. It has been his bed for the last 15 years. Eventually, almost as an afterthought, Gonzales asks for a few coins, but like the rest of Cartagena, there’s a carefree, Caribbean languor to his request. “In Bogotá, in Cali, in Medellín, people think about money, money, money,” one Cartagenan had told me earlier that day. “People in Cartagena are happy with what they have. We live for today, not for tomorrow.” In the old town, the plazas fill each evening with tourists, but Plaza de la Trinidad broaches the divide. Here, tourists mill among a host of locals. It’s a place where bohemian meets traditional, as university students mingle with families and ageless old men. At the square’s edge, beside a church the colour of butter, food carts serve up hamburgers, hot dogs, juices and beer. Murals cover the scraped walls, and chilled sounds pour from the open doorway of the most unprepossessing building of all. Inside this building is the excellent Demente, a tapas bar as chic as anything in New York. Ceiling fans turn on a glass ceiling, and the exposed brickwork combines with rocking chairs to create a rustic atmosphere. I grab a beer and head out to the handful of tables on the narrow footpath. For the next couple of hours I simply watch Cartagena fade into night and yet brighten at the same time. Bikes whirr past and the notes of a guitar drift across the square, being played not for money but for simple pleasure. It’s a vision of Cartagena at rest, fanned by a sea breeze. The old town is filled with boutique hotels. The personable Hotel LM is an excellent choice, with seven rooms and a swimming pool just a couple of metres from the hotel’s open kitchen. Nearby, Ananda Hotel Boutique has an Asian Zen atmosphere and a spectacular rooftop pool deck with views across the city. LAN Airlines operates six one-stop flights per week from Sydney to Santiago (Chile), with onward connections to Cartagena (via Bogotá). LAN also has three non-stop flights per week from Sydney to Santiago in a code-share partnership with Qantas. South America Travel Centre organises individual trips and itineraries to Cartagena. Humidity and rainfall are at their lowest from around December to April.